Code is Love - this is a very basic core theme for WordPress, which i developed in dependence on the WordPress standard-themes, the notesblog-core-theme and a lot of more. I use this core theme as a base for almost any kind of WordPress Theme which must be developed. It saves many hours within the development process. Every developer visiting this site is invited to use this free Theme, too. And also to help with the further development process. 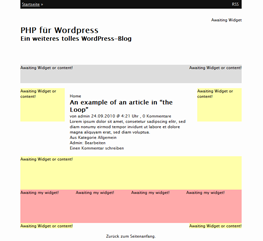 This is a "WordPress Core Theme", that means it is not a theme to power a blog, but a code-skeleton to build a great theme to power a blog as fast and as good as possible. I tried to make a skeleton with the maximum flexibility which helps with structuring and building a medium sized WordPress project, while adding a lot of helpful functionality for customizing all parts of the theme there this is important. The theme is under development and is improved monthly, everytime when I am working on a project. This theme is GPL licensed. Be free to use this open theme for any kind of project, and please give me feedback how to improve it. Various improvements, including easy Theme options page, additional libraries, code improvements and also code reduction. Added Theme Options Page Template, some new functions, a library and default content formatting template. Added Functions, Theme settings, global textdomain and libraries. Adding a lot of features of WordPress 3.1 and the new Theme "twentyeleven", support for post formats. Various minor improvements, better organization of page headings. Minor Bugfixes, improved comments template. Dieser Eintrag wurde am 25. October 2010 um 23:23 in der Kategorie WordPress veröffentlicht. You can book the comments for this article RSS 2.0. Feedback, discussion, commendation and critics are welcome: Write a comment or trackback.